Happy Friday! Before we get started, I just want to say that I’m SO excited that you guys are loving these Chicago roundups! 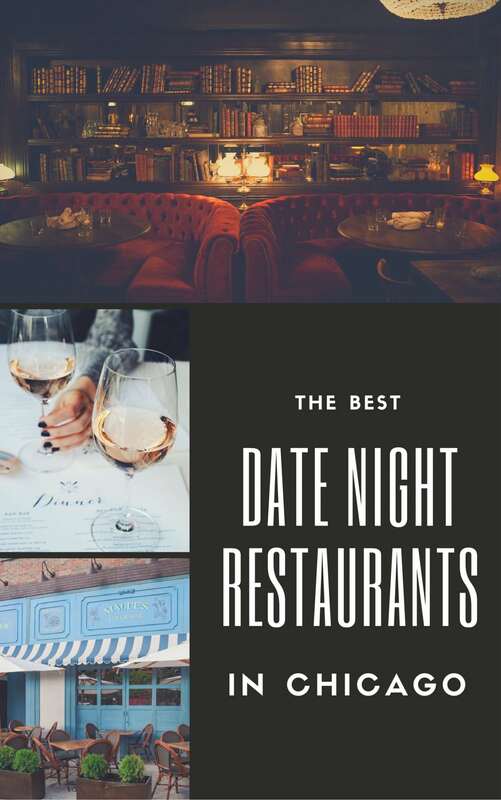 Since they’ve been such a hit, I thought I’d keep going with another popular topic – Best Chicago Date Night Restaurants. Plus, with Valentine’s Day only a month away, I figured it would be helpful to publish now! Since we live in Chicago and there are a million great spots, I decided to split this up into a few categories. 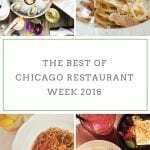 First, I put together the Top 15 Chicago Date Night Restaurants based on a combination of my favorites and the most recommended from you! After that, I listed a few of my other favorites, and at the very end, I’ve listed all of YOUR go-to spots! 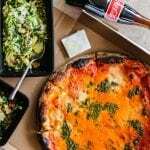 I know that there are a LOT of restaurants in this post, so I’ve pointed out something about each place, whether it’s the type of food, what I love to order, or even what neighborhood it’s in. I hope it’s helpful! I love love love Maude’s Liquor Bar because it has everything you want in a date night restaurant. The West Loop location is great, and the ambiance is dark, cozy and romantic. Plus, even if you have to wait for a table, the drinks are amazing and the food is worth the wait. Make sure you order the French Onion Fondue… just trust me! Adam and I love sharing plates, which makes tapas at Cafe Ba Ba Reeba perfect for us! We actually went to Cafe Iberico on one of our first dates, but since then we’ve both agreed that Cafe Ba Ba Reeba has better food. The last time we were there, we were going to meet friends but they had to cancel last minute… don’t worry, Adam still asked for multiple orders of bacon wrapped dates, and we had the best time ordering slowly with multiple rounds of drinks. So fun. I just tried Beatnik on Tuesday this week and I loved it! First of all, it’s absolutely GORGEOUS! Holy moly, I couldn’t get over how pretty it was. As for food, a few of you told me that you were underwhelmed, but we only ordered from the Mezze portion of the menu and everything we tried was great. Some of my favorites were the Wild Mushrooms, Broccolini, Halloumi, Butternut Squash and Mussels! My friend Kaitlin has been telling me to go to Oyster Bah for a while, and when Adam and I finally went over the summer, it didn’t disappoint! We both love oysters, so if you love ’em too – start there. We also shared a bunch of appetizers that night instead of ordering our own entrees… are you catching on that this is our favorite way to eat out?! I remember the garlic shrimp and octopus were the best! Ada Street is a hidden gem…. no, but really, it’s actually hidden! If you weren’t actively looking for this restaurant, you wouldn’t find it. But you should look for it, because the food is delicious and the cozy interior is the perfect escape on a winter night. I’ve been wanting to try Duck Duck Goat ever since it opened, so when Adam’s friends suggested going back in November, I was SO excited! Turns out the slap noodles, fried rice, bao, and scallion pancakes are all ridiculously delicious. And even though it’s great for a group, I also think it would be a super fun restaurant for a date – or double date! I’m honestly kind of ashamed to admit that I’ve never been to Gilt Bar. Especially because SO MANY of you recommended it when I asked for suggestions on Instagram yesterday! Along with dreamy decor and an amazing menu, I also found out that they have a photo booth, so you can document your amazing date forever ? How adorable this that?! Nerd alert: Adam and I went to Little Goat after watching Stephanie Izard win Iron Chef Gauntlet. Such a nerdy reason, but who cares? It was one of my favorite dates! I personally love that you can get amazing food in such a relaxed environment. Who knew chicken fingers and a chocolate shake could be so appropriate for a date?! We went to Mon Ami Gabi for Restaurant Week last year and absolutely loved it. Amazing french bread, the best escargot, and delicious entrees. If you like french food, this place is a must! I’m not a steak gal, but if you and your man are, I hear Maple & Ash is the best around! If you can’t afford to eat at Alinea, don’t worry! You can still eat at Roister, Chef Grant Achatz’s new casual option in the West Loop. I haven’t been yet, but my friend Kit highly recommended it to me. I’d ask her if you have any questions! When you want date night and your man wants BBQ, Chicago Q is a great compromise. I personally love it more in the summer because their patio is so cute, but it’s a solid date spot no matter what! Bavette’s definitely isn’t a cheap option, but that’s because it’s swanky AF! Think dim lights, exposed brick, leather seats and a huge Le Boeuf section for the meat lover in your life. Tango Sur is a Latin American Steakhouse up in Lakeview that literally everyone raves about. A cute neighborhood spot with amazing food that’s also BYOB? Jackpot. Did I leave any of your favorites off of these lists? Are you adding any to your personal lists? Also, was this post way too long or do you like seeing all of the reader favorites? Let me know!! I love Cafe Ba Ba Reeba and Mon Ami!! Mon Ami had a fantastic restaurant week menu. Definitely think I need to make a point to head there. Boka is super romantic- and you can eat in the bar area if you don’t want to spend a ton of money! Schwa is hands down the best meal I’ve ever had- both times I went! Not cheap but so so worth it!